On Monday, a lava lake vanished from the top of Kilauea volcano on the island of Hawaii. The flow of liquid rock that normally fills Puu Oo crater, on the volcano's eastern flank, had been abruptly turned off. Days later, a crack opened in the ground at a subdivision more than 10 miles away, spewing splatters of red-hot, molten rock. Clouds of steam rose into the sky and the acrid odor of sulfur dioxide filled the air. The episode, which prompted the evacuation of several hundred residents late Thursday, is the latest in an ongoing eruption that dates back more than three decades. Lava has been spilling out of Puu Oo crater since 1983, making Kilauea the world's longest continuously erupting volcano. 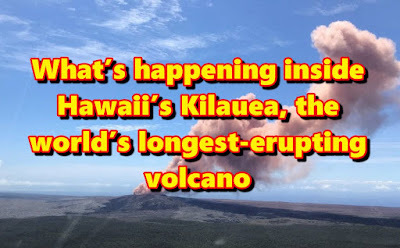 Kilauea is also the youngest of Hawaii's aboveground volcanoes, which have formed over the course of the past 5 million years as the Pacific plate drifts over a hot spot in Earth's mantle. It features two main craters — one at the summit, Halemaumau, and Puu Oo, on the eastern flank. In recent years, eruptions have alternated between the two. Like many Hawaiian volcanoes, Kilauea is made of basalt, a type of lava that flows very easily. Rather than building up into a steep, towering peak like Krakatau in Indonesia or Mount St. Helens in Washington state, the fluid-rock at Kilauea creates a broad, shallow dome known as a shield volcano. This fluid lava makes for effusive — rather than explosive — eruptions. Indeed, the volcano's name means “spewing” or “much spreading,” according to Hawaii magazine. Rocks moving upward through the mantle beneath Hawaii begin to melt about 50 miles beneath the surface. That magma is less dense than the surrounding rock, so it continues to rise until it “ponds” in a reservoir that's roughly three miles wide and one to four miles beneath the summit. As pressure builds in the magma chamber, the magma seeks out weak spots in the surrounding rock, squeezing through the earth until it reaches a vent to the surface. Since the current eruption began in 1983, the U.S. Geological Survey has documented 61 eruptive episodes at multiple vents along the East Rift Zone, one of Kilauea's weak spots. The flows have submerged houses and roads under rivers of molten rock, and surging “fountains” of lava have occasionally sent rock fragments raining down on the landscape. According to Hawaii Volcanoes National Park, the current eruption of Kilauea produces as much as 650,000 cubic yards of new rock every day — enough to resurface a two-lane road 20 miles long. The eruption has added about 500 acres of new land to Hawaii's Big Island. In 1990, a natural tunnel formed by flowing lava broke, sending it streaming into the community of Kalapana. By the end of the year, a church, a store and 100 homes were buried beneath more than 50 feet of lava, according to the USGS. Deadly explosive eruptions are rarer. Deposits from Kilauea's past suggest that violent explosions can occur when water comes in contact with molten rock, flashing into steam. In 1790, a group of warriors was caught in one of these eruptions. From 80 to perhaps hundreds of people were killed; thousands of their footprints are now preserved in ash that hardened into rock. Several people have died on the volcano in recent years. In February, a tour guide collapsed while viewing an active lava flow, Hawaii News Now reported. Authorities said he may have inhaled toxic steam that formed when recent rain reacted with sulfur gases in the molten rock. 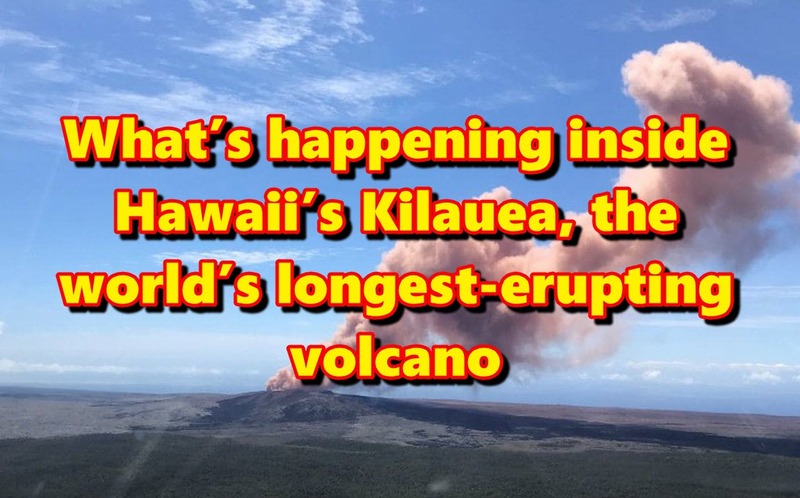 Kilauea is one of the most closely observed volcanoes in the world, Mattox said. Some five dozen seismic monitoring stations dot its surface, listening for the rumblings of magma breaking through rock. Tiltmeters and GPS stations on the ground and radar satellites in the sky are used to monitor the mountain's movements — rising magma can cause the volcano to swell like a balloon. As gases dissolved in the molten rock are released into the air, they're detected by on-site and space-borne instruments. “Volcanoes give us a warning when they're about to do something,” Mattox said. The emptying of the Puu Oo crater's lava lake, the surge in seismic activity along the East Rift Zone, and weeks of uplift around the crater all signaled that something was bubbling under the surface. But it was unusual that the new fissures opened up so far from the main vent at Puu Oo. Sally Sennert, a USGS volcanologist embedded at the Smithsonian's Global Volcanism Program, said there may have been a blockage in the magma's usual path to the surface, diverting the molten rock in a different direction along the East Rift Zone. “Magma is going to look for the easiest way out,” she said. Sennert, who writes the agency's weekly volcanic activity report and has been monitoring the situation at Kilauea, compared predictions about the volcanic activity to tornado forecasting. “Scientists can look at changes in seismicity and deformation, and they can tell that something might happen. But they can’t tell the exact pathway of the magma or how long it’s going to last,” she said. The Hawaii Volcano Observatory had issued “watch” alerts for Kilauea since at least April 24. The alert level indicated that the volcano exhibited heightened unrest and increased the potential for an eruption. On Thursday, the alert level was changed to “warning,” meaning a hazardous eruption is underway.